What is a good Cinebench Score? Where are Cinebench Scores Saved? Why no Cinebench GPU Scores? Go get Cinebench R15 Benchmark for your System, it’s free, and test-drive your CPU to be able to compare it with the ones in this list. Ok, some more Info about these Cinebench Results: Cinebench Scores are linear. This means a CPU that scores 2000 Cinebench points will be twice as fast (in Cinema 4D Rendering) as a CPU that scores 1000 Cinebench points. All these Scores are difficult to grasp if you don’t put them into context. I am asked what a good Cinebench Score actually is almost every day and as so often there is no definite answer. It depends on what the CPU you are benching is supposed to be able to do. Are you mainly writing texts in Open Office? A Cinebench Score of 250 is good. For your specific use case! Are you rendering a lot in 3D Software? In this case, a Cinebench Score would be good, if the CPU that is being benched renders fast enough for you to finish your projects on time. Usually, a dedicated rendering PC should have upwards of 2000 Cinebench points. The more the better. Are you mainly gaming on your Computer? Then you will have to look at the Cinebench Single-Core Score. For 4K 90FPS gaming you should have 170 Cinebench Single Core Points or higher. In addition, you would need upwards of 4 Cores. That would mean you should have a Multi-Core Cinebench Score of 700 or more. This wasn’t a problem when CPUs used to reach only around 1000 Cinebench Points but becomes a problem more and more nowadays, especially with the extreme high-core count CPUs such as the AMD Threadrippers or Server CPUs such as Dual / Quad / Octa Intel XEONs and AMD Epycs. Because Cinebench divides the rendering task into buckets, there is a possibility that at the end of the benchmark run, there are only one or two buckets left that are actually rendering because these buckets might take a bit longer (maybe because the rendered Image is more complex in these buckets). Of course, this means, that the rest of the cores lie dormant during this time, and this can distort the result extremely. We can say the same about the startup time of the rendering task. It might take a half a second or a second to distribute all the rendering tasks to the cores, and considering that the entire benchmark-run only takes about 5 seconds on 64 Cores, half a second can make a huge difference. This is also why you don’t see many Server-Grade CPUs with high-core counts being featured in Cinebench R15 Benchmarks. The Cinebench-Multi Score uses all available CPU-Cores for rendering. Cinebench-Single Scores will only use one CPU-Core for rendering. Why would we need the single-core score? There are lots of Software-Parts in 3D-Softwares and Games that rely and can only be calculated on a single core, and won’t run faster if more Cores are available. Think about simulating a Liquid. Every simulated frame depends on the previous frames. You can’t tell 10 cores to simulate 10 frames, because you have to simulate all frames up until the frame you want to simulate, or else you don’t know what the liquid is doing or where it is at that particular frame. This means, only one Core at a time can simulate a coherent liquid. Here you will need a maximum Single-Core Cinebench Score. There are ways around this of course, as in using multiple liquids that intersect each other and together look like a higher resolution liquid. This then could be calculated on multiple CPU-Cores, every individual liquid part on another core. 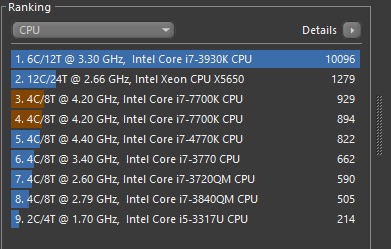 Here you would want a maximum Multi-Core Cinebench Score. As there is so much dependent on User interaction, the CPU has to wait until the User actually fires off a Bullet or opens a door to a new area, meaning the CPU can’t use its other cores to pre-calculate what you will be doing, because it can’t know what you will be doing. Again, a high Single-Core Cinebench Score is of great use here. Another great example, why the Single-Core Cinebench Score is very important for CG Artists, is because the 3D Viewport in 3D Softwares such as Cinema 4D, Maya, 3dsmax, Blender and the like, is very dependent on the speed of a single CPU-Core. As soon as you have a hierarchy of deformers and modifiers on a mesh, only one CPU-Core can calculate the form of this mesh. The CPU Core has to step through the hierarchy of your deformers and modifiers until it reaches the end of the chain. No other CPU-Cores can help in this matter, as only the one core that is calculating the mesh hierarchy knows how the mesh actually looks at a given hierarchy and calculates the form of a mesh that is being modified by deformers. Multiple Cores are useful if you have multiple meshes that can be worked on independently by different CPU-Cores. Here, depending on the Software, a high Multi-Core Cinebench Score will be of use. 2. Multi-Core Cinebench Score: The higher the better. Good for CPU-Rendering, and tasks that are parallelizable. Good for when the Computer renders on its own, without you having to sit and watch it work. 3. Single-Core Cinebench Score: Higher is better. Best for Viewport Performance and interaction with the PC. This usually impacts your active working speed & snappiness on the PC the most. This is an interesting metric, as one would think the Multi-Core Cinebench Score should be exactly number-of-cores x the single-core Cinebench score. Usually, though, the multi-Core Cinebench Score is somewhat lower than this since features such as Turbo-Boost play a large role when using only one core. Turbo-Boost is when the CPU automatically clocks higher when using one core (or not all cores), as there is more headroom in terms of power draw and temperature. So a single core could clock as high as 5 GHz but an all-core bench will run at only 4 GHz on all cores. This is the main reason why the Multi and Single-Core Cinebench R15 Scores can’t be directly calculated. Intel has had a single-Core advantage for some time now, meaning if you are looking for a CPU, that you can actively work on as fast as possible, with the System reacting as snappy as possible, it is usually a good Idea to get an Intel CPU such as the i7 8700K or i7 8086K. These CPUs will be amongst the highest Single-Core Cinebench Scores in the list. Beware though, these two CPUs don’t have the best value in terms of multi-Core Performance and only have 16 PCIe-lanes, so rendering with lots of GPUs would require a different CPU for maximum speed. AMD has recently introduced the RYZEN CPU Family, which has great multi-Core Value but doesn’t quite reach Intel in terms of Single-Core Speeds yet. RYZEN and Threadripper CPUs are excellent for CPU Rendering and have the highest Multi-Core Cinebench Scores but have a slight Single-Core disadvantage, meaning they might not be as snappy in an active working environment. Of course, we are talking HEDT here, this will only be noticeable in fairly complex use cases and 3D-Scenes. Head over to “Best Computer for Cinema 4D” and “Best Hardware for GPU Rendering” for more in-depth insight into these highly interesting topics. As there are so many different Processors available and being updated constantly, if I missed any that you are interested in, let me know and I’ll add them to the list! As Cinebench R15 is based on the Cinema 4D CPU Render Engine, it is, of course, a great way of benchmarking Cinema 4D on your Hardware, if this is a Software that you use or are planning on using. Cinema 4D is very similarly structured like many other 3D-Software such as 3DS Max, Blender or Maya, as it relies heavily on similar workflows and Hardware usage. Cinebench in itself is often used as a Benchmark for benching all kinds of 3D Render Software and therefore the go-to Benchmark in this field of work. Let’s take a look at some of the most interesting CPUs in the Cinebench Scores. AMD Ryzen Threadripper 2990WX: This CPU is an absolute Multi-Core Monster. Scoring over 5000 Cinebench Points, it easily takes the Cinebench Score lead. It has 32 Cores and 64 Threads a base clock of 3,2 GHz with an all core precision boost of 3,4 GHz and a precision boost overdrive on a single core up to 4,2 GHz. This CPU is the top pick for Multi-Core optimized workloads, especially if it is utilized as a dedicated render node. CPU Rendering, Encoding, anything that takes full advantage of extreme Core Counts. This highest Cinebench Score has a 1500 Point lead to Intel’s highest-scoring Cinebench CPU, the i9 7980XE which is even more expensive. AMD Ryzen 2700X: With 8 Cores, 16 Threads and a precision boost of up to 4,3 GHz, this CPU is great for Gaming, good for Rendering and good for active Work in all kinds of Computer Graphics and 3D Softwares. It trades blows with the i7 8700K, though is a lot cheaper and has a much higher performance per dollar ratio. Intel i7 8700K & 8086K: The i7 8700K is an extremely popular gaming and high-core clock optimized CPU, great for active work in 3D Applications with excellent Viewport snappiness. Gaming workloads are usually unmatched by this i7 unlocked CPU. The 8086K is an anniversary edition CPU is essentially a well binned, overclocked 8700k. Expect this one to become rather hot in demanding workloads. Intel i9 7980XE: Intel’s currently leading Cinebench Score CPU has 18 Cores and 36 Threads that clock at only 2,6 GHz base and turbo boost up to 4,32GHz on select cores. It is great for Multi-Core workloads, though at the moment would be the second pick compared to AMD Threadripper CPUs, that are unbeatable in terms of performance/dollar. Depending on where you installed Cinebench (usually C:\Program Files\MAXON\) you will find a folder called \cb_ranking\ inside. Cinebench R15 does have an OpenGL Benchmarking option. This Feature though unfortunately is so old, that the resulting scores are all over the place. It was supposed to test the OpenGL capability of your Graphics Card, but almost any GPU nowadays is just too fast, making other components such as the CPU bottleneck and influence this Benchmark too much. In its newest Version, the Cinebench R20 Benchmark, Maxon has already removed this feature. Ready to configure a great PC with high Cinebench Scores? 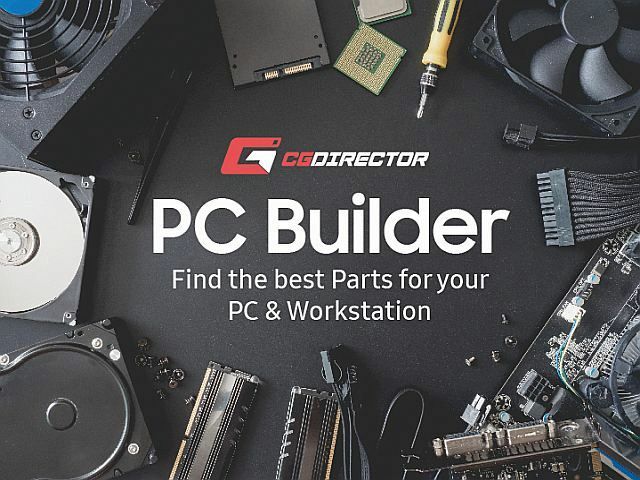 Head on over to the CGDirector Custom PC-Builder Tool that lets you configure your Computer at custom price points for all kinds of purposes. It suggests parts, that work best together and gets the maximum performance out of your budget. What Processor are you thinking of buying? 2950x 4.2ghz or 9900k 5ghz/5.2ghz for 3ds Max modeling 100% and rendering 20% corona vray lumion. revit, and Adobe app illustrator… . ASUS ROG Zenith Extreme Alpha AMD X399 vs ASUS ROG Maximus XI Extreme Z390. If its so much more modeling tasks you are doing than rendering, then I’d go with the i9 9900K. 750W will be enough even when overclocking with a single cpu and single gpu. If you have more gpus of course go with at least 500W + 250W per additional gpu. Currently my workstation currently is with Revit, 3dsmax , autocad Full version & photoshop. It’s quite heavy and slow. I would like to upgrade my pc that can afford me multi tasking my job. May I ask what kind of spec is suitable for my PC in order for me to work for my Revit file in the same time I can manage to do my renderings ( not high res )? If you are CPU rendering, you’ll need more Cores such as the AMD 2950X. Also 16GB of RAM will probably be filled up quite quickly with multiple apps open and working at the same time. The Quadro performs well in some 3D Apps but not so much in others. For 3dsmax and Photoshop for example a GTX or RTX seems to be the better choice. CAD Apps such as solidworks can work well with Quadro GPUs. Also what kind of Storage Device do you have? A HDD or SSD? I added all AMD APUs that are currently available. Thanks so much for creating this site. You’ve really helped me out in my research. Your detail is unmatched and it’s fun to read your articles. I have a question about my current set up and if you think it would be worth it to upgrade. I am using this machine for Cinema 4D work. Primarily texturing, lighting and animation work. Redshift mainly, some Arnold, and some X-Particles which seem to slow down the system the most in the viewport. That System looks pretty good already. What you can do is bench your overclocked CPU in Cinebench single core score and see what you get. Then you can compare what other cpus such as the i9 9900K would give you in addition. 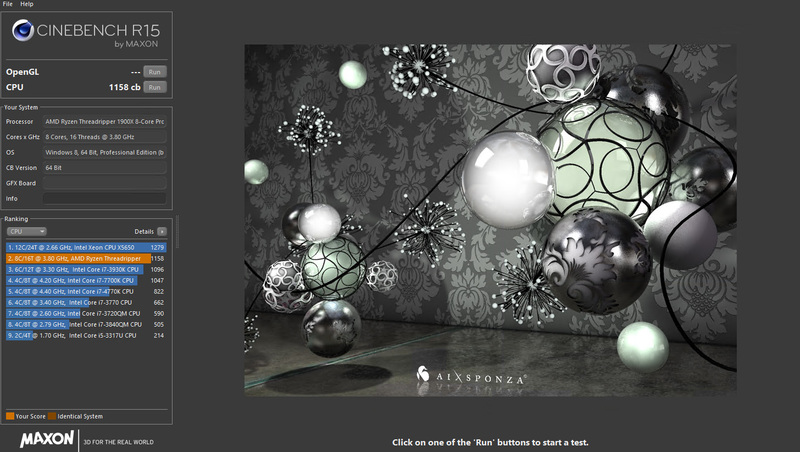 I’ve found your site very interesting according to good quality rendering benchmarks scores and lot’s of information. I’m also gathering some scores of Cinebench R15 and see something strange whith Intel XEON E5-2699 v4 (22c) Cinebench score – my founded scores are 150 (1T) and 3240 (MT) – there is about 30% more than your score – my numbers are also close to estimate calculate based on other Xeons scores..
Could you check these numbers for Xeon E5-2699? What kind of source of these scores you are? Of course I could be wrong also but this score looks suspiciously. Interesting! Are you running these in a 2-cpu configuration? I am running a 2S setup with the Xeon E5-2696 V4’s and hitting 5.700. I’m planning to build a 3dsMax PC in India, I’m struck between Intel or AMD. Most of the people are suggesting Intel i5, however most of the online forums suggest AMD Ryzen. My requirement is to use only 3dsMax with rendering for learning and a less of production work. If you don’t mind, Could you please help me out by considering my budget for CPU is $250-$300. If possible you can recommend any specific products on my personal email. If your main focus is rendering, then the Ryzen 2700X is a great choice, as it fits nicely into your budget with its current ~300$ price. GPU you can consider anything from gTX 1060 upward, if you plan on GPU rendering, go get a higher Tier GPU such as the 1070Ti or 1080Ti. On your Cinebench results you don’t have the OpenGL scores, any chance this could be added I find it very useful. I will look into this, thanks for your feedback! Actually Alex I am slightly confused, you say that faster single core speeds make you machine snappier but isn’t that down to OpenGL speeds? I would love to know if faster single core speeds speed up real-time playback since I do a lot of animation work and find that C4D can chug quite a bit with heavy scenes – I am talking fps and get tired of having to do lots of preview renders. Yes, CPU Single Core Speed is responsible for the snappiness of your viewport and ultimately the ability to play back your timeline in real-time. I have been reading everything on your website and it’s all proving really helpful. However, what I mean about OpenGL and single core speed is more to do with frame rates. Case in point my ageing i7 980 scores 90 fps in Cinebench using a nVidia 980ti GPU. I see threadrippers (which I am thinking of getting) with the same GPUs getting the same OpenGL scores but they have higher single core speeds than my i7 980. So in theory I would see no improvement (other than when rendering). Sorry for the confusion. There are two things to look out for. Clock Speed and IPC. The Problem with IPC (Instructions per cycle) is that they usually aren’t advertised or listed anywhere, so the best metric to go by is GHz. But your point is valid. If you have a i7 980 that clocks the same as a Threadripper for example, it would seem that they both are the same speed. The thing is though, that newer generation CPUs can do more per clock cycle, which is IPC. So a year 2011 CPU with 4 GHz might be half as fast as a year 2018 CPU with the same clock speed, because the year 2018 CPU can “calculate” more per GHz Cycle. Usually the CPUs that people compare arent too old, so the GHz metric is good enough, but in your case you should look at a benchmark that actually measures the IPC too. In this case the Cinebench Single Core Score. Unfortunately I don’t have the i7 980 Score here yet, though I can see if I find it anywhere. What does your CPU score in that benchmark? The thing with the OpenGL Cinebench Benchmark is, that the underlying Car Chasing Scene is not great for Benchmarking your Viewport Performance. It Benches your OpenGL, Shader, Shadows, AntiAliasing, Anisotropic Filtering and so on, but not how fast it will update Rigs, Deformers, Mesh operations and so on. In the OpenGL Benchmarking Scene, the entire Meshes are Prebaked, there are no rigs, no deformers and the like. So I would not use it for checking on viewport stats. Unfortunately Maxon does not have a better benchmark available for this, but this sure would be great to have a standardized scene with lots going on hierarchy-wise with all kinds of different cinema 4d objects, generators, cloners, rigs and so on. The Problem your Viewport slows down, is not because your GPU has insufficient OpenGL Performance, but because your Scene has too many generators, cloners, rigs, deformers and so on, that can only be calculated by the CPU. Alex – that’s hit the nail on the head! Explained a lot to me so I am now looking at either Threadripper (since I still do CPU rendering) and one of those fast Intel 8700K jobbies. I am going to start doing a bit more GPU rendering so I am leaning towards the Threadripper. Also torn between the ASUS Prime X399 and the MSI X399 GAMING PRO CARBON AC since one has space for three GPUs and the other four – any preference from you? I currently also have a MSI Gaming Pro Carbon AC mainboard running with 4x 1080Ti. I can recommend this. The “AC” part though is an additional Wifi Card that won’t have any room anymore if you have 4 GPUs built in. So might go the LAN or any other Wifi route. They are Blower style Cards. I wouldn’t go normal fan cooled if you plan on stacking them up against each other. Even with blower style, they get quite hot and don’t Boost into Turbo all that much. Water Cooled would get you some extra performance as the cards can run at higher clocks, but I am not sure if the additional price warrants it. In my day to day bussiness I myself need great rendernodes that don’t need maintenance, that you can just slap some cards into or swap with other cards, but if you have the dedication to go water-cooled, feel free to report back and let me know how it goes!